Of all football programs, Western Christian shouldn’t be intimidated by it’s current predicament. The Lancers finished last in the Ambassador League last season, but perhaps even more revealing is that new coach Michael Khoshkbariie began spring practice with just 18 players on the roster. Western Christian has beaten the odds before – quickly. The Lancers went from three wins to an undefeated regular season in just two years, surging to the CIF-SS semifinals in 2013. But just as quickly, Western found itself at the bottom of the league again. Will Summit’s talent translate into a league championship? 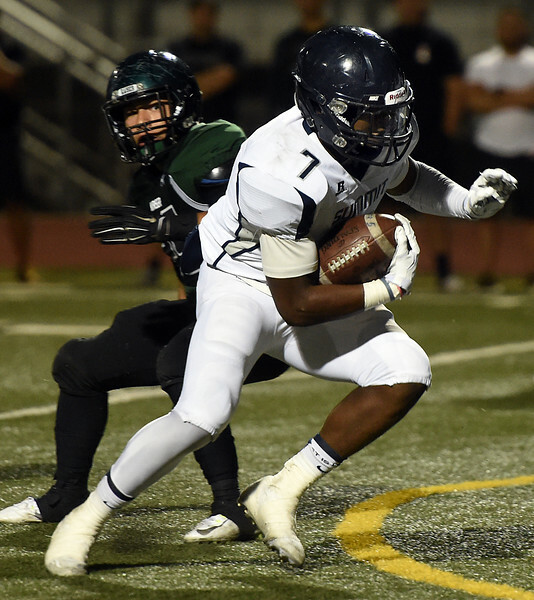 Running back Stephen Carr, who is verbally committed to USC, is one of four Summit players with Division-I scholarship offers entering the 2015 season. 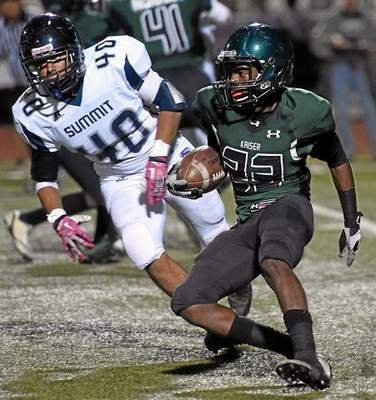 If it could convert scholarship offers into victories, Summit could crown itself today. The SkyHawks football team enters the 2015 season with four players sporting Division-I offers, including Damian Alloway’s list of 16. Had he not committed to USC nearly two years before he could sign a letter of intent, running back Stephen Carr would presumably have more than five scholarship offers. After becoming the first school other than Kaiser to win a Sunkist League championship – Summit claimed consecutive league titles in 2011 and 2012 – the SkyHawks have finished second the last two seasons. But talent hasn’t been much of an issue, according to head coach Nick Matheny. Etiwanda’s Jordan McLaughlin didn’t exactly make the conventional choice when he committed to USC today, but could the point guard be the type of transcendent talent that could help turn the program around? It’s certainly a possibility. After all, the senior has often been compared to Etiwanda alum Darren Collison, a four-year NBA veteran who led UCLA to three Final Fours. The college coaching community certainly thinks a lot of McLaughlin. The final list of schools under consideration include some of the most storied programs in the country in Kansas, UCLA and Indiana. In the end, I don’t think McLaughlin wanted to leave Southern California and Andy Enfield, the coach that took Florida Gulf Coast to the sweet 16 last season, gave the Trojans the edge. Who can blame a 17-year-old for being intrigued by an offense that took the college basketball world by storm a few months ago? Here is the complete story on McLaughlin’s recruitment. WR — Michiah Quick (Central, Fresno) 5-11, 170, Sr.
WR — John “JuJu” Smith (Long Beach Poly, Long Beach) 6-1, 180, Sr.
TE — Tyler Luatua (La Mirada) 6-4, 230, Sr.
OL — Kammy Delp (Diamond Ranch, Pomona) 6-4, 305, Sr.
OL — Toa Lobendahn (La Habra) 6-5, 295, Sr.
OL — Damien Mama (St. John Bosco, Bellflower) 6-5, 350, Sr.
OL — Kolton Miller (Roseville) 6-8, 280, Sr.
OL — Jordan Poland (La Jolla Country Day) 6-8, 335, Sr.
QB — Keller Chryst (Palo Alto) 6-4, 210, Sr.
RB — Royce Freeman (Imperial) 6-1, 220, Sr.
RB — Joe Mixon (Freedom, Oakley) 6-1, 205, Sr.
PK — Kevin Robledo (Westlake, Westlake Village) 6-0, 170, Jr.
Upland football coach Tim Salter didn’t shed much light on Thursday’s Los Angeles Times report that two Upland coaches were removed from their positions and three Upland players had been declared ineligible. Salter gestured to a group of at least nine Upland players not in uniform, but declined to specify how many were not playing due to injury.